Serves: 4 people Difficulty ': Easy Preparation time: 30 minutes + 30 minutes in the refrigerator INGREDIENTS 150gr. yellow flour 100g fine. white flour more 'than is necessary for dusting 2 eggs 120gr. 100g of butter. 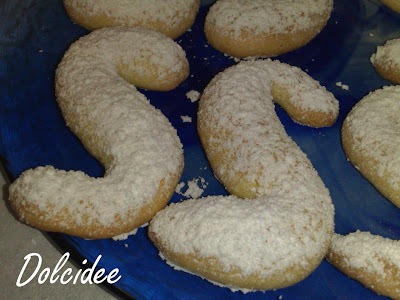 sugar grated rind of 2 lemons 1 teaspoon baking powder Mix PROCEEDINGS -------------------------- The two forms' of flour in a bowl and add the yolks, 100g. of melted butter, sugar, lemon peel and baking powder. Knead the ingredients until dough is crumbly but fairly homogeneous, which then refrigerate, covered, for 30 minutes. After this time, take the dough, roll out pastry on floured surface to a height of about 2mm. and cut out discs of 4 - 5cm. in diameter, lined up on a baking tray greased with butter. Bake cookies at 160 degrees for 15 minutes, then remove and let cool on a wire rack before serving.